TCIL JE Recruitment 2017 Notification was released by Indian Govt. 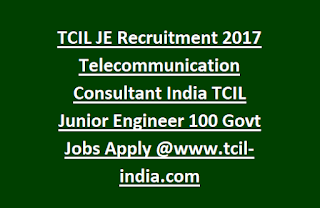 for recruiting 100 TCIL Engineer & Jr. Engineer Jobs. TWD Tripura Jobs interested and eligible candidates can apply online through the official website www.tcil-india.com. 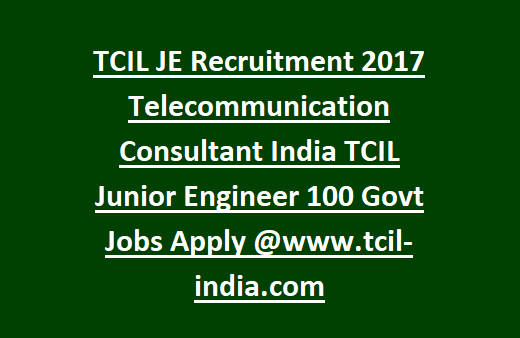 TCIL Junior Engineer Jobs interested candidates should apply on or before 12-10-2017. This Jobs Purely Contact Basis. TCIL JE Jobs eligible candidates should send their application as early as possible. Selection process for TCIL Junior Engineer Jobs will be based on the performance in the personal interviewed by the panel. For more information about the TCIL Jobs recruitment vacancies, age limit and education qualification given below. Education Qualification for TWD TCIL Junior Engineer Jobs will be given in the below. Minimum 2 years post experience in the field of Electronics/Telecom having knowledge of supervision, installation, testing, and operation. Minimum 2 years post experience in the field of Electronics/Telecom having knowledge of supervision. TCIL Junior Engineer vacancies are based on Interview for more selection details go through the notification. NOTE: Contract Period for TCIL Junior Engineer jobs will be 1 year initially which is extendable as per the requirement of the project.